The DVG-64 series has been discontinued. Please see the DVG-64A as next generation of this product or contact our Pressure Engineering department. 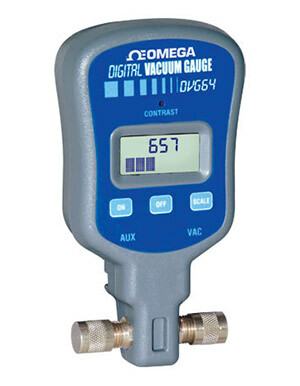 The OMEGA DVG-64 delivers high precision at a low price. It can accurately read vacuum from 12,000 microns down to 0 over a wide temperature range of 35° to 125°F (2° to 52°C). The vacuum can be displayed in user selectable units.